Canada’s hockey players let out their emotions with a postgame celebration after defeating the Swedes, 3-0, for the gold medal in Bolshoy Ice Dome. SOCHI, Russia — Henrik Tallinder was the eighth defensemen on this year’s Swedish Olympic hockey team, essentially a spare part. So you can imagine how he felt Sunday afternoon when he found out he was going to be on the bench for the gold-medal game, after all. Center Nicklas Backstrom had been removed from the Swedes’ lineup against Canada. At the time, Tallinder wasn’t even aware that Backstrom had tested positive for an illegal allergy medication. “I got the call an hour and a half before the game to get in and get dressed,” the Sabres veteran said. “So it was pretty quick.” It was hardly what his team needed, either. The Swedes were already down two centers, Henrik Zetterberg and Henrik Sedin, because of injury. They were also without star winger Johan Franzen. With Backstrom gone, Sweden was missing its top three centers. Later, Swedish head coach Par Marts called the IOC decision a “miscarriage of justice” and “like kindergarten.” Tommy Boustedt, general manager of the Swedish national team, said the IOC “destroyed one of the great hockey games in Swedish history.” “It’s a big loss,” Tallinder said. “It’s a big player, one of our best offensive guys.” The Swedes certainly had a complaint. But after watching the Canadians during the last two games of this tournament, it’s hard to believe any single player could have made a difference in their relentless charge toward their second consecutive Olympic gold medal. Defenseman Nicklas Kronwall, the Swedes’ captain, said his team would have needed to play a perfect game to beat Canada. That was a lot to ask against the Canadians, who got better with every game and dominated the Swedes, 3-0, to become the first men’s team to go unbeaten through an Olympics since the Soviets in 1984. They stifled the Swedes in the same manner they had the Americans two days earlier, checking the opposition all over the big ice, controlling the puck, giving clear sight lines to goalie Carey Price, and limiting the serious chances by the undermanned Swedes. Defensively, they were near-flawless. 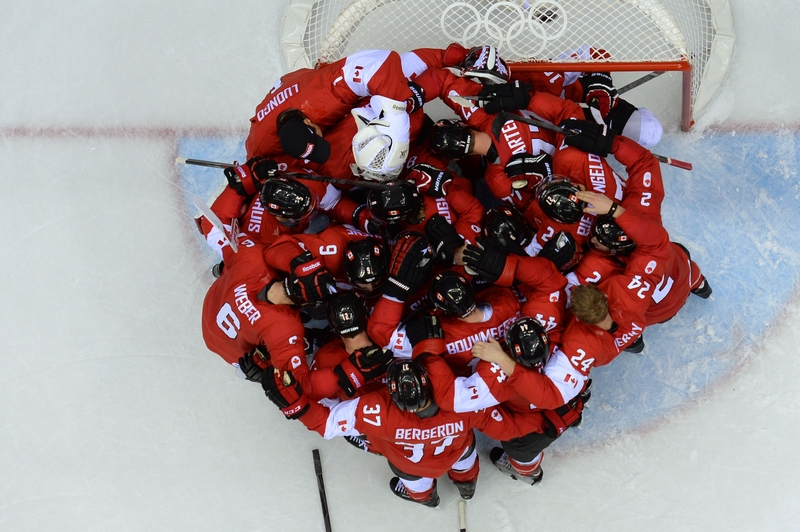 Canada pitched shutouts in the semifinals and gold-medal game. They didn’t allow a goal over the last 164 minutes of play. Sweden hit a post early, but didn’t have many serious scoring chances as the game went on. Coach Mike Babcock had predicted after the semis that his offense would finish plays. He got goals from Jonathan Toews, Sidney Crosby and Chris Kunitz – one in each period and, coincidentally, all from players who hadn’t scored a goal in the Olympics to that point. The legion of Canadian hockey critics had fretted about the sputtering offense, wondering if the large ice really was an issue and the coaches were overloading the players with information. It turns out the offense was just feeling its way. Babcock seemed a bit touchy about the notion that the Canadian coaches were executing some plodding defensive strategy. He felt his offense was a huge factor, a major reason why Canada allowed just three goals in six games and never trailed in the 12-day tourney. Steve Yzerman, the general manager and architect of Team Canada, backed up his head coach on that. As the old cliche says, the best defense can be a good offense – even when it’s not producing. When you have the likes of Crosby, Toews, Corey Perry, Ryan Getzlaf and Patrice Bergeron flying around the ice, it can send an opposing offense back on its heels. “When you talk about great defense, sometimes you get confused,” said Babcock, lecturing some of the finest hockey minds in the Canadian media. “Great defense means you play defense fast and you have the puck all the time, so you’re always on offense. Babcock was on a roll. You could feel all the pressure of coaching the best players in the world, in the most intensely loyal and critical hockey nation, seeping out of him. Babcock stood up, turned things over to Yzerman and walked off, a big smile on his face. His case was closed. Now he had to get to the Closing Ceremonies.